U.S. Appeals Court Finds Texas Voter ID Law Discriminates Against Minority Voters : The Two-Way The 5th Circuit ruled that the law might not intentionally violate voters' rights, but does have a discriminatory effect. It called for a lower court to fix the problem before the November elections. Voters stand in line to cast their ballots inside Calvary Baptist Church in Rosenberg, Texas, on March 1, during the primaries. 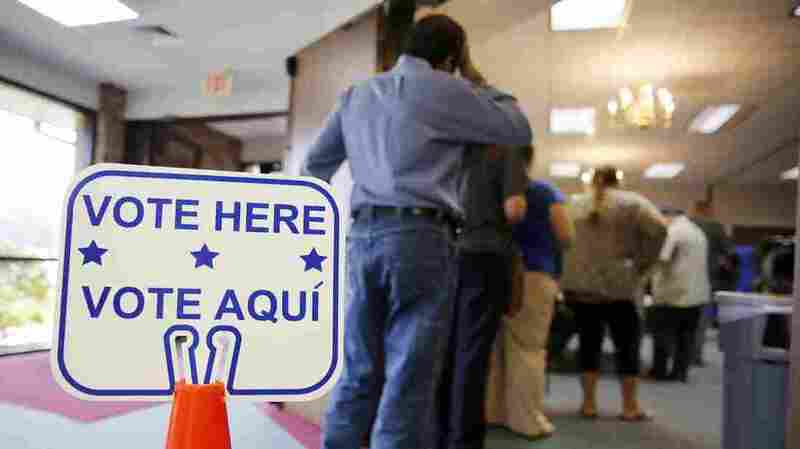 A federal appeals court has ruled that a Texas voter ID law has a discriminatory effect on minority voters, and it has ordered a lower court to devise a remedy before the November elections. A district court had found not only that the law discriminated, but that it was intentionally designed to do so. The 5th U.S. Circuit Court of Appeals saw some flaws in that conclusion and instructed the lower court to reconsider that element of the case and rule again — preferably after Election Day. The judges also ruled that the law is not a poll tax and declined to consider whether the law puts an unconstitutional burden on the right to vote. "Part of that has to do with the type of photo IDs the Legislature designated as legitimate. For example, military IDs and concealed handgun carry permits — they're lawful to vote. But state employee photo IDs and university photo IDs are not. "So in federal court, the plaintiff's lawyers have argued successfully that the Legislature approved ID cards that were more likely to be held by white Republican voters and excluded IDs that were more likely to be held by minority Democrats." "The Texas law first took effect in 2011; a judge's order later struck it down, but that order has been on hold since October of 2014. "Last summer, a three-judge panel from the 5th Circuit 'ruled unanimously that the law does not equate to a "poll tax" but does discriminate against minority voters,' as the Two-Way reported. After that ruling, the case was put before the full 5th Circuit for review." This spring, the U.S. Supreme Court gave the 5th Circuit a deadline of July 20 to rule on the case. As NPR's Nina Totenberg has reported, the deadline was motivated by suspicion that the 5th Circuit might have been "dragging its feet" to keep the law in effect until after the election. The idea, Nina says, was that a ruling by Wednesday "would leave enough time for the Supreme Court to decide whether to block the law for the upcoming election." In its decision Wednesday, the 5th Circuit called for the lower court to change the law in a way that "disrupts voter identification rules for the 2016 election season as little as possible" — but it said some changes were necessary to keep the law from discriminating against minorities.